Winterizing plumbing pipes is a process that prepares household plumbing for freezing temperatures that can cause leaks and breaks in the home. When water freezes, it expands as it becomes ice. This expansion produces pressure within pipes which causes damage. Winterizing plumbing is recommended when a house will be vacant for a long period of time and no water will be running through the pipes. The winterizing process involves emptying the water heater, draining all water from the pipes and filling all fixtures with antifreeze solution. Begin with a plan for winterizing your plumbing. It is easy to miss a step, so you make yourself a checklist of all parts of the house with the steps detailed below, including all taps and valves. Mark them off as you complete them, so you'll know you did everything—and won't have any nasty surprises come cold weather. Shut off the main water valve, turn off the water pump and the water heater. It will protect heating elements in the water heater when there is no water inside the tank. Open all drain valves and all taps. Check off each on your list, so you are sure all taps are open. A closed tap could create a vacuum that will hold water inside of pipes. All valves and taps should remain open throughout the winter. Using air compressors, blow excess water standing out of the pipes. Open the drain valve in your hot water tank and let it discharge until it is empty. Be careful, because sometimes these hot water tanks don’t have floor drains and you will need to connect a garden hose to it. Drain all the water that is left in the holding tank, especially the one located in the rubber diaphragm, the one that is used along with the water tank to build pressure. As an additional protective measure, add antifreeze to the jet pump case. Flush toilets to remove as much water as you can from the tanks and the toilet bowls. If all water cannot be removed, add antifreeze to prevent any water from freezing and cracking the toilet. Check all sink and tub drains that could have drain traps. Add some antifreeze on each one of them to prevent water from freezing and cracking in the traps. If you have enough time to check the conditions of the building's plumbing, identify the pipes most vulnerable to freezing. Look for pipes located outside walls and windows, uninsulated pipes and pipes installed near unheated spaces. It is also important to check for any cracks or openings in walls, floors, and ceilings. If you find holes during your inspection, caulk them to keep cold air from entering those gaps. Insulate pipes with insulation sleeves, wrapping or slip-on foam pipe insulation. Do not leave any gaps without insulation as cold air can affect the pipe in these spaces. Plastic piping is more tolerant of freezing than old copper or steel water pipes. Inspect the exterior of the property making sure that all visible cracks are sealed. 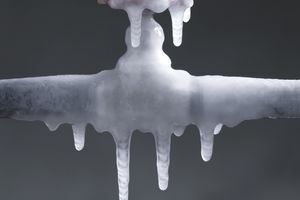 Cold air can enter through the cracks and once inside it will cause your pipe to freeze. If visible cracks are noticed, seal them using caulking or spray foam to fill the voids. Maintain a heating source inside the building to protect pipes against cold. It is a good idea to maintain a faucet dripping allowing the water to move freely and continuously preventing it from freezing. Make sure the crawl space is properly insulated. Block all vents that lead to the outside using cardboard or wood. Don't forget the hose bibs. Hose bibs are normally left unattended causing them to burst in the middle of the night. Drain hose bibs and insulate with covers. Once this has been completed, deactivate bibs at the shutoff valve. Use heat tape to protect pipes from freezing. Heat tape is one of the preferred methods for winterizing plumbing, but be aware that these might bring additional hazards. The U.S. CPSC has provided safety recommendations for homeowners using heat tapes to help prevent fires.